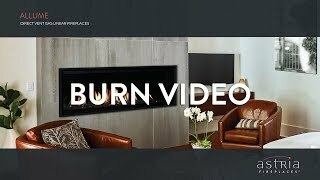 The Allume linear direct vent gas fireplace offers a sleek modern appearance that is right at home in contemporary and transitional spaces. An expansive ceramic glass opening provides an exceptional view of the gently dancing flames rising through the beautiful reflective black glass floor media. The Allume includes a multi-function hand held remote for the ultimate in comfort and control.